What changes occur in the chin with age? As we age, the skin on the chin can become lumpy and develop a coarse orange-peel like texture. This is sometimes referred to as a ‘’cobblestone chin’’. This chin dimpling is also seen in individuals with a recessed chin. The appearance of such a chin can become worse whenever the chin muscle (mentalis)contracts. Other changes that occur with ageing include loss of volume, saggy chin (double chin) and some individuals can develop a receding chin (smaller, shorter and a backward retreated). How can age related changes in the chin be addressed? At Bedford Skin Clinic, we correct chin dimpling and chin recession by administering Botox so that the activity of the chin muscle is reduced. This results in the appearance of smoother skin on the chin which can last between three to six months. We treat chin volume loss and receding chin using the thicker, higher-molecular-weight dermal fillers, such as Restylane Sub-Q, Juvederm Voluma and Radiesse. For the majority of clients this results in a significant improvement in the appearance of the chin for approximately one year. 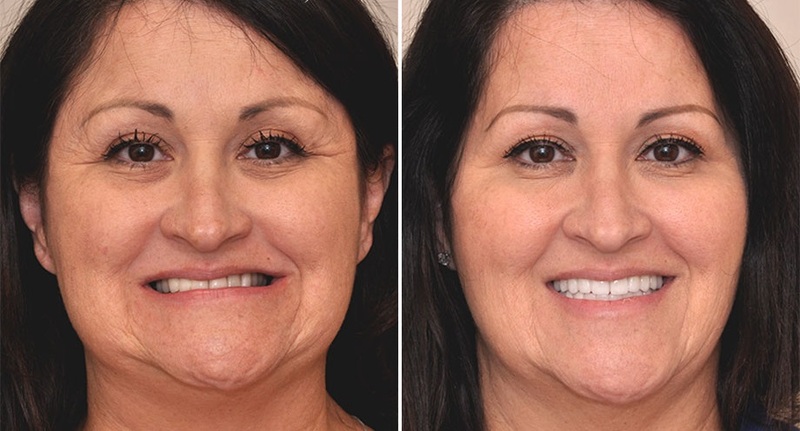 Severe cases of receding chin usually require surgical correction. For saggy chin (double chin), we offer fat dissolving injections, Aqualyx and for some cases, liposuction of the chin. We will be introducing Kybella®(Belkyra®) as soon as it becomes available in the UK.